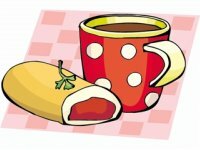 Gathering the necessary applique supplies such as easy applique quilt patterns, light box, paper-backed fusible, pressing sheet, zigzag machine, and the right needles and threads will get you off to a good start when learning about applique quilting. Your choice of fabrics will influence how easy your applique experience will be. If you are not sure as to what fabrics to use visit some quilting stores for advice. Woven fabrics are the easiest to handle. But your choice of fabrics should be compatible. So, stay with the woven fabrics until you gain confidence. You will never go wrong with 100% cottons! When deciding on easy applique quilt patterns remember applique quilting is a forgiving art, not an exact science. For your first applique quilt just make sure the technique is a simple one-layer design. 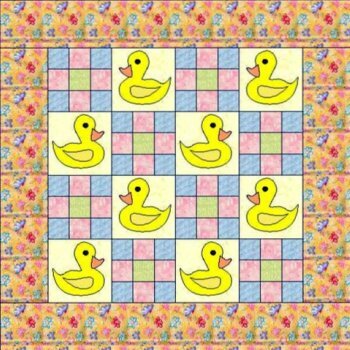 Look for a beginner pattern for your first applique quilt such as our FREE Baby Duck Pattern? Give it a try for that new baby! 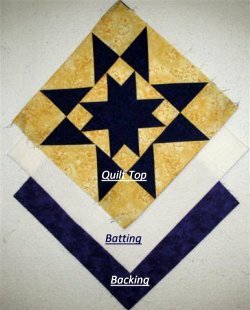 It is real easy to applique a quilting motif onto a square of fabric so long as you have the right applique supplies. A light box is at the top of the list when it comes to applique supplies needed to get you started. 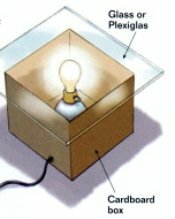 If you do not have one try to Build a Light Box from items you most likely have on hand. It is easy. Later, if you find that you like applique work you may want to purchase a light box. However, they are not cheap and your hand made box will work just fine for years and years. Until you are able to round up a few household items necessary to make a light box, use any window pane. If I'm operating in the light of day, I use any outside window pane as a light box. One of my favorite mottoes: Use it up, Wear it out: Make it do, Or do without! And so it is with all applique supplies too. Tape your pattern on the window pane using either scotch or masking tape. Next lay your paper backed fusible web over the pattern and tape it to the window. Trace the pieces of any applique quilt pattern onto the Paper side of your fusible web. Draw the image exactly the same size using a black permanent marker. Fusibles is an important applique supply in order to adhere one fabric to another. Having trouble finding a pressing sheet? Try the link below. 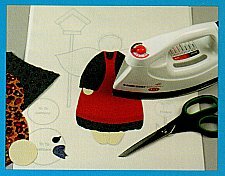 When fusibles were introduced, along with them came non-stick pressing sheets which is another must have applique supply. You can't use one without the other. Fusibles use to be tedious to work with as the glue on the web will melt when heat is applied, and will easily spill out onto the bottom of the iron or ironing board cover. You must then stop, possibly run to the quilting store to get a tube of iron-off,(another great applique supply) and then clean up both surfaces before moving forward. In any event, cleaning up is not a fun thing to do...I would rather be learning about how to use all those quilting supplies! I use a 13-inch by 17-inch Applique Pressing Sheet by Bear Thread Designs is coated with Polylon for a quick release. Look for a pressing sheet that is translucent (most of them are). Get the largest size you can fine. You are going to love this product whether you do a lot of applique quilting or not. When using any simple applique quilt pattern you are sure to learn the basics and build on that knowledge! A sewing machine that has a zigzag stitch is a must have applique supply when working with applique quilt patterns. Tension control, stitch width and length control, an open-toe applique foot with a groove on the bottom that is flanged to allow for turning of corners and tight curves, are necessary machine features as well as items on your applique supply list. You will also need to change out your throat plate with the plate that has an elongated needle hole as your machine will be moving side to side. The good news is nearly all of today's machines have all of these features. Needles - It's all on the Package. The information that you need is printed on the front of each needle packet. So your only job is to make sure that you have the right needles on your applique supply list. Need needles for your sewing machine or quilting machine? Check these out...I use the Groz-Beckert brand on my Handi-Quilter size 16 &/or 18 99.9% of the time. 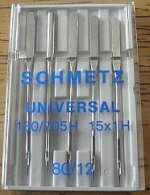 The Schmetz needles is universal and works well on most brands of sewing machines. The first number is called a system number and your sewing machine manual tells you what system number is right for your machine. Schmetz brand is some of the highest quality needles made and they have developed a needle for nearly every need. This is what I use in all five of my sewing machines. The second number seen on the bottom of the packet here is a needle size which determines its suitability for a given fabric. It is listed in metric and U.S. sizes. The third number beside the system number in our picture describes the point as it relates to the properties of the fabric to be sewn. SUK,SKL,SKF are true ballpoint needles used for spandex, elastics and coarse knitwear. A very important applique supply is a package of high-quality machine needles. Always start each new applique quilt pattern with a new needle. You will need to change the needle more often then when doing normal sewing as the density of the applique stitches tends to dull and heat a needle. The right size needle is critical in obtaining a smooth, even stitch when applique work is being done. Thread characteristics greatly impacts your applique work. Cotton threads are softer than man-made fibers and tend to untwist and spread a little on the surface, giving much better coverage without crowding the stitches. Whenever I can I always use cotton thread when doing my applique work. This is especially good advice for beginners. The numbers on the spool is a good insight for thickness of thread and the number of plies twisted together. The higher the number, the finer the thread. You should have a good understanding about the things that affect your choices when selecting applique quilting patterns as discussed above. If you still have questions about these general topics, there are many good books out there. Pick one up at your favorite quilt shop. Move your needle position on your machine to the center position. When using a satin stitch it seems the machine is barely moving and that is because it is barely moving! So, learn to ONLY guide the fabric...do not pull on it! The machine should feed the fabrics evenly without your help. Use your right hand only to make adjustments in the stitch width when needed. Use the left hand only to guide and not pull. Start by using 60/2 thread in the bobbin and 50/2 or 60/2 embroidery thread in the top of the machine. Use a 70/10 Universal needle in the machine. Adjust the top tension so that the top thread shows on the bottom but no bobbin thread shows on the top. When you find this balance you do not have to constantly change the bobbin thread to a color that matches the top thread. This is more economical and a real time-saver! A satin stitch width is set close enough to appear as a solid line, but not so close that they bunch up. The stitch should completely cover the raw edge giving a well-defined image. Start by setting your machine on a width of 2 and adjust from this point if necessary. When the stitches are too wide the curves, corners, and points are more difficult to sew around. 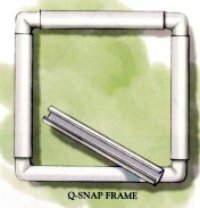 1/8-inch is sufficient to hold the edge securely without raveling. When the stitch shows gaps it tells you that your stitch length is not set close enough. When the stitch draws the fabric in it tells you that your stitch length is set too close to each other. Start by setting your machine on a width of 2 and a length of 3. The object is to have a tight stitch where top thread shows on the bottom but no bobbin thread shows on the top. When you see bobbin thread on the top side you probably need to loosen the top tension. Rarely will you need to mess with the bobbin tension. Leave this for the trained repairman. 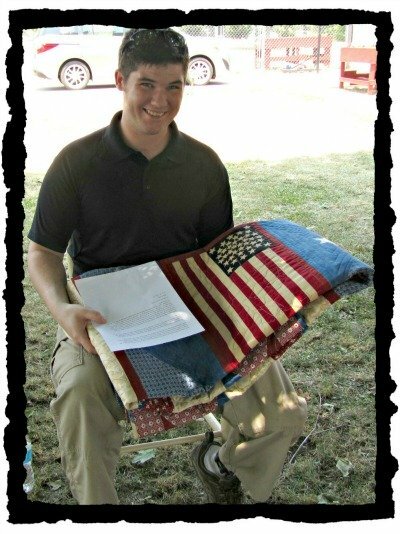 Commemorative quilts, fun to make and couldn't be easier! Try our puzzle for a little fun!